I have put in about 500 drills, games, transtion games etc. in the previous 9 Drill of the Day sections and I think it is time that other coaches contribute their ideas. You can write the description and attack jpeg of gif files, and other picture formats that I haven't tried, with diagrams and the system also accepts pdf files. You could draw the diagrams by hand and they scan and save as a pdf etc. I am sure there are other ways to do this. Coaches from beginner to pro visit this site so all levels are welcome. Lets all learn from each other. Great idea Tom - Here is a simple 1 v1 battling game that can be used when goalies are warming up at the other end, or when you don't have any. Kids love it, and it's a great way to work on good stick habits, D-side positioning, and battling for space with the puck. I got inspiration from the GIT thread and tryed to modify one game from the "Transforming Play......" book. I have not tested it in practice yet. If you have any ideas to make it better please let us know..
Great games Dave and Kai. Keep them coming. In our backceking D100 game last night we tried something new. Started as a 2 on 2 with 2 supporting the defense from the top of the circle. Then we added a variation. The greens sent 3-2-1 players to support from the top of the circle and the whites sent 1-2-3 players. So every rush was a different situation and the players had to read it. Dean came to my school skills session and took a video. We played 3 different games in the last 30 minutes with the rule that everyone had to be SILENT. Keep the drills and games coming. This is the ninth drill section. 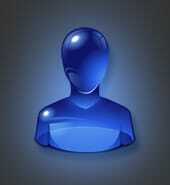 The others are in the forum index but some aren't stick topics so you have to look for them. The search function can find topics for you that are on the site. Type in something like 'power play' and the site finds all instances of the topic. Also Hockeycoach.com has a drill section were I have put in over 300 drills from this site. It is in an easy to read format links to the videos and diagrams on the abc site. http://hockeycoach.com/group/hockeydrills is the link to the drills section. Coaches lets have some more practice ideas from everyone. Here's a great little full ice transition/thinking game. Sorry. The description for the 2 vs 2 Read and React game above didn't post. On whistle, four players begin skating backward as shown. First player up boards; second player along blue line. Coach passes to one of the four and the 2 vs 2 commences. Receiver can choose to attack any net and players must react. Timing. Pass to players at speed. To begin, X1 slash skates thru N-zone, receives pass from X2 and goes length of ice for shot. After passing, X2 receives pass from X3 and goes near net for shot. X3 now receives appropriate pass from X4 and continues on in for shot. Canuck D Warm-Up: A good warm-up for all, works well when you have lots of players....F's work on pass reception and shooting, D transition skating and passing, goalies work on angles. Runs from both sides simultaneously. I have used your Canuck D Warm up drill before. Good on footwork and puck movement for the D.
This drill is just a variation of the drill that you posted , working on the hinge , or switching. I also like adding a one touch pass for the forwards..
Forwards open face pivot (reverse pivot) facing the puck , and can one touch puck and get a return pass form the next player in his line. At first it might be a little confusing , but works the forecheck against the breakout under pressure. Can be a fast pace game sometimes. - you can set the defensive (breakout team ) deep or at the blue line to give hard pressure or passive pressure. - NZ group starts by dumping the puck in one end and forechecks ste out by coach or team structures. - Breakout against forechecking pressure. Forecheckers can score . A on freeze of puck by goalie you can put in back in the corner or give the breakout team a free clear. - the breakout team must carry the puck out over the blue line and forechecking stops. - the breakout unit then dumps it in the opposite end and now become the forecheckers at that end. - Plays is continuous with this format. At first you can signal the end of the forecheck with a coaches at the blue line whistle until they understand the flow. Also if you have a smaller NZ you can make the forecheck stop just pass the top of the circles. Keep score , good breakouts against forecheck. turnovers etc. Bonus for scoring on a forecheck. works on forechecking , breakout , D zone coverage , dump and a chase etc. I was sent this by the IIHF. They produce good material. Usually from the Sports school that gives out university degrees in hockey coaching located in Vierumaki, Finland. You can find over 50 new drills for passing at the IIHF Hockey Centre! Go to www.hockeycentre.org to see drills, seminars, exercises and other ice hockey resources. If you have trouble logging in, please contact at iihce@iihce.fi for assistance. 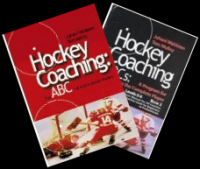 I asked Terry Johnson who I coached at the U of Calgary for 6 years with to give my players some cues on how to play a 1 on 1.
http://www.hockeycoachingabcs.com/filemgmt/index.php?id=67 is the link to his on ice instruction and then showing the drill we used to practice the technique. TJ was a good defensive defenseman in the NHL and played for Quebec, St. Louis, Calgary (86 Stanley Cup finals) and Toronto. He does a great job of teaching the principles of defending. Terry Johnson talks about the key principles of defending 2-1, 3-1 snd 3-2 situations in this video. When the attackers pass back hinge before passing up ice. Follow the pass up the ice and join the attack. Defenders should close the gap when the attackers regroup. 1. Blue 1 and 2 attack vs Red 1 and 2. 2. Red 1-2 breakout-attack vs Blue 3-4. 3. Red 1-2 regroup with red 3-4 in nzone. 4. Red 3-4 hinge and pass to red 1-2. 5. Red 1-2 continue attack vs blue 3-4. 6. Red 3-4 follow and support 1-2 from point. I was watching the Russian Women's National Team practice and this is a shooting drill they used. Face the puck. Shoot while skating. Follow the shot for a rebound. After shooting either screen or circle back and look for a rebound from the next shooter. 1. One leave then get a pass from two. 2. One go in and shoot-rebound. 3. Two leave and get a pass from three. 4. When all players have shot then go down the othter wing. *Pause one second after passing so the goalie has time to get set for the next shot. Here is a simple transition game to focus on forechecking habits and D moving their feet with the puck. - D1 & D2 can pass to eachother behind the net, but must carry the puck from goal line to top of circles before passing to support players who wait passively in NZ. - Next D wait at redline to defend in opposite direction. They back up and retrieve puck AFTER it's dumped. No cheating! http://www.redbull.com/cs/Satellite/en_INT/Article/Ice-Hockey-Watch-The-Red-Bull-Salute-Finals-Live-021243137104604 is a link to where I helped coach in 08-09. They are in a big tournament now. It gives a good feel for NA coaches on how games in Europe are on the ice and in the stands. A 2 vs 0 Regroup and Attack drill. 1. BLACK: F's cross and drop to start. 3. Blue/Green: Some passing options. 4. O's begin from other end. 5. Purple: Add a Defenceman - with rule that he must receive second or third pass. 6. Add to 5. that O's start with pass to D (who has jumped out)instead of cross and drop. 7. 2 vs 1: D gaps up to play rush. Not Shown. 8. 3 vs 0/1: Whichever F receives first pass, makes pass then joins play. Last night we hooked up with the coaches of Finland at the Flames-Red Wings game. I have worked with Kalle Kaskinen an assistant coach and Raimo Helminen the head coach was one of my assistants along with Jirki Lumme and Teppo Numminen in 1995 when I was the head instructor of the Finnish association hockey school in Vierumaki. We met after the first period in the restaurant and sat there and watched the second period together on a TV. They had their last practice before leaving to play in their group in Edmonton starting Dec. 26. I went with my son Jim to watch and took about 30 minutes of video at the practice. The video is in the files section. Just watched 24/7 about the upcoming Flyers-Rangers Outdoor game Jan. 3. Really enjoyed it. Pass hard, keep skating all the time. Pass and follow the pass. Screen, rebound. This happens the same time from each end. 1 - D1 pass behind to D2. 2 - F1 get breakout pass from D2. 3 - F1 skate to big ice and pass to F2. 5 - D1 pass to D2. 6 - D2 pass to F2 who skated around circle. 7 - F2 attack and shoot..
8 - D2 follow attack and get a pass from F1. 9 - D2 take a point shot and F2 while F1 move in for a shot pass and rebound. All times are GMT. The time is now 00:19AM.